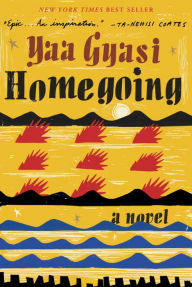 Yaa Gyasi's Homegoing is the runaway word-of-mouth hit of 2016. Everyone at BEA in May was talking about it. Then people read it — and absolutely raved (three months after its publication, it has a 4.42 rating on Goodreads). And Gyasi even got a 5-minute segment on The Daily Show during which Trevor Noah called it "the most fantastic novel I've read in a long time." It's the story of two half-sisters and their descendants, beginning in late-18th century (what is now) Ghana. One sister's family stays in Africa, the other immigrates to the U.S. The novel reads like interconnected short stories, each about one new generation of the families, and covers more than 300 years. It's a novel about slavery and colonialism, family loyalty and suffering, and ultimately, ends with a note of hope. I don't know what else to say about this book, except to remind you that if it's true that reading brings empathy, than this is an absolutely essential, non-negotiable must-read novel. The ending is something I'll not forget for a long time. 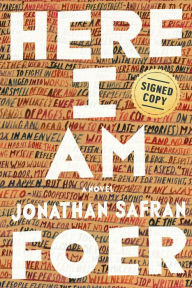 Here I Am, Jonathan Safran Foer's first novel in 11 years — the most anticipated novel of the year for many book nerds, me included — is a massive tome that sort of meanders through a bunch of big, important questions. What does it mean to be a Jewish man in this crazy world? How can any marriage survive the pressures of modern culture? And just what is Israel? Yeah, that last one throws you for a loop when Foer branches out and goes all geo-political. Again, this not a narrowly focused novel. It isn't a novel that'll be confused with anything like a focused, taut Phillip Roth novel. The real story is about an upper class Jewish family living in Washington, DC. The parents Jacob and Julia, early 40s and married for about 15 years, are having marital issues. The cause of these problems so far is nothing major — just, as relationships do, suffering from the pain of a thousand small cuts. But it's soon clear all these un-discussed minor issues only need one major one to catalyze into a full-blown marriage blow-out. When Julia finds a phone Jacob had been using to sext with a co-worker, well, we have our major issue. And there's a major fight, where one tells the other "You are my enemy." Will they work out their problems and stay together for the sake or their family? Or will they dissolve their bond? Yeah, these aren't exactly cheerful characters, and this is not a cheerful book. Nor is it an especially gripping one. You've heard the clichè "compulsively readable"? This is not that book. There are moments of wit, levity, and stretches that really do pull you in. But on the whole, it's a really exhausting read, not the least because it's 600 pages (and you know I'm person who actually enjoys long novels!). And then there's an earthquake in Israel. And the marriage collapses further. And Jacob's grandfather dies. And we spend the last two-thirds of the novel with these strands of story mixed in with the Big Profound Questions Foer wants us to consider (or that he's considering, which he needed this novel as the vehicle, or something). Also, there's an incontinent dog. I give this three out of five stars — I'm not sure I'd recommend it to anyone but the biggest Foer fans. There were definitely parts of this novel — about pages 150-250, and parts of the last 100 pages — that are utterly brilliant, and as fun to read as anything I've read this year. But the rest just really wilted and withered. 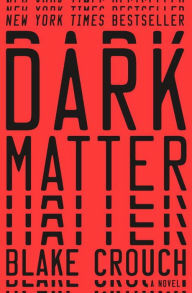 Blake Crouch's trippy thriller, Dark Matter, has the feel of a late-night, stoned-to-the-gills dorm room conversation. But it's also a read that zooms at along at breathless, breakneck pace, partially owning to the fact that it has the feel of a thinly veiled movie script (short, sparse sentences, lots of chase scenes, exposition in dialogue, cliffhanger chapters, etc.). This can be annoying or exciting, depending on your personal reading preferences. In this case, I enjoyed it — the movie script aspect of the writing doesn't detract from the story itself, which is an inventive take on the fiction about science genre (which is different, barely, than science fiction, I think). But before we get into "Dude, but what if there are infinite universes and therefore infinite burritos? "-type questions, and more thoughtful discussions about superposition (you know, Schröinger's cat) and theories of what dark matter might be, we meet our protagonist: A normal guy named Jason Dressen, who is an average upper middle-class Chicagoan. Jason is a physics professor at small-time Chicago college, happily married to a beautiful woman named Daniela, and the proud parent of a teenager named Charlie. Jason had given up his promising career as a research physicist in his late 20s to marry and have a child — a decision for which he's often questioned by his colleagues, but about which he has no regrets. One night, Jason goes to have a drink with one of these former colleagues, who incidentally, has just won a major scientific prize Jason may have won if he'd stayed the research course. On the way home, Jason is kidnapped at gunpoint, shepherded to an abandoned power plant on Chicago's south side, and made to take a mysterious drug. He wakes up in a lab, not remembering much. But he's safe, and all the people around him — obviously scientists of some sort — are hailing him as some sort of scientific hero. What the heck just happened? Naturally, he doesn't understand, and his first instinct is to run away as fast as he can. But then he's shown the research he abandoned 15 years prior — only now, that research has been followed through to completion, resulting in a device that allows humans to travel to multiple universes, which he has apparently just done! You could read this in one sitting if you wanted to. It's a great thriller to wrap up your summer or take on a plane. Highly enjoyed it.